These Spinach Artichoke Quinoa Stuffed Bell Peppers are a part of my master plan to be more spontaneous. I can see it on my agenda now: Wednesday night, 5:30 p.m. to 6:45 p.m. – Do something unknown and mildly reckless. Be home in time for dinner. Have I mentioned that I am dependent upon my calendar app? While it’s romantic to think of myself as the go-where-the-wind-takes-me/fly-by-the-seat-of-my-pants sort, the truth is, I like having a master plan to guide my day. When we go out, I make reservations. Before I head to the grocery store, I write a shopping list. Our entire travel schedule is recorded from now through December. Romantic or not, ad libbing is not my style. Which is why, when Ben called to tell me that he’d found a last-minute deal on tickets to New York City and my response was, “BOOK THEM!” I surprised us both. We leave in less than two weeks, and half of the trip is still unplanned. Who am I? Of course, I also promptly made a Google doc with all of our flight information and the reservations I’ve booked thus far. Let’s call me a free spirit in progress. In an act of mild spontaneity (I’m a work in progress, remember? ), I headed into the kitchen with an uncharacteristically loose vision for these quinoa stuffed bell peppers. 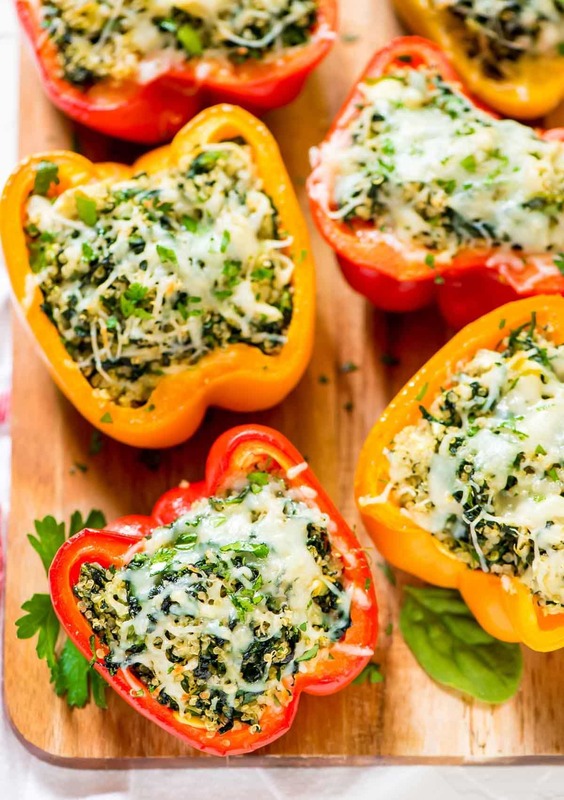 I wanted to marry everyone’s favorite spinach and artichoke dip with one of my favorite easy dinners, Chicken Quinoa Crock Pot Stuffed Peppers. I didn’t have the recipe fully written out, but I had a hunch it was going to be delicious. I was right. 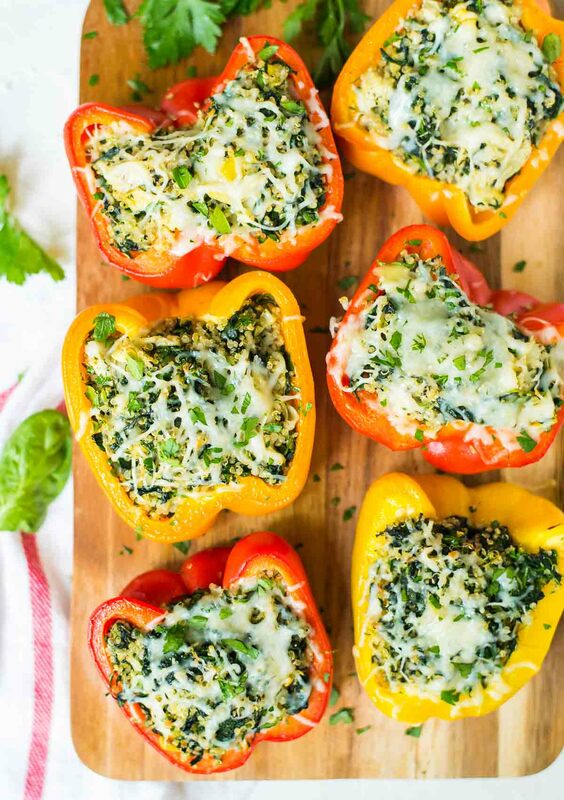 The peppers are tender on the outside, the filling is gooey and cheesy on the inside, and thanks to the addition of Greek yogurt in place of the mayo you’ll find in classic spinach artichoke dip, this recipe is light and healthy too. 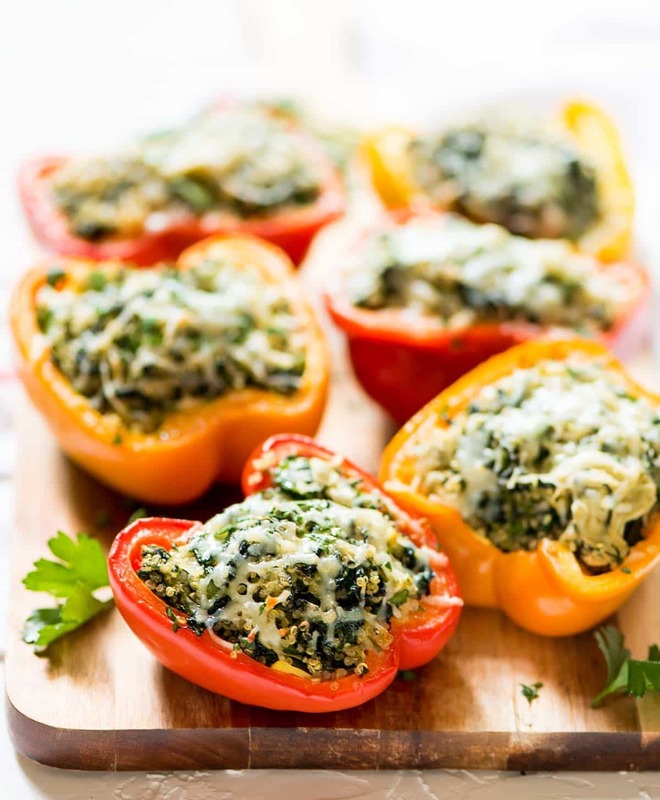 To keep the stuffed bell peppers extra budget-friendly and fast to prepare, I used frozen spinach, though fresh will certainly work too. 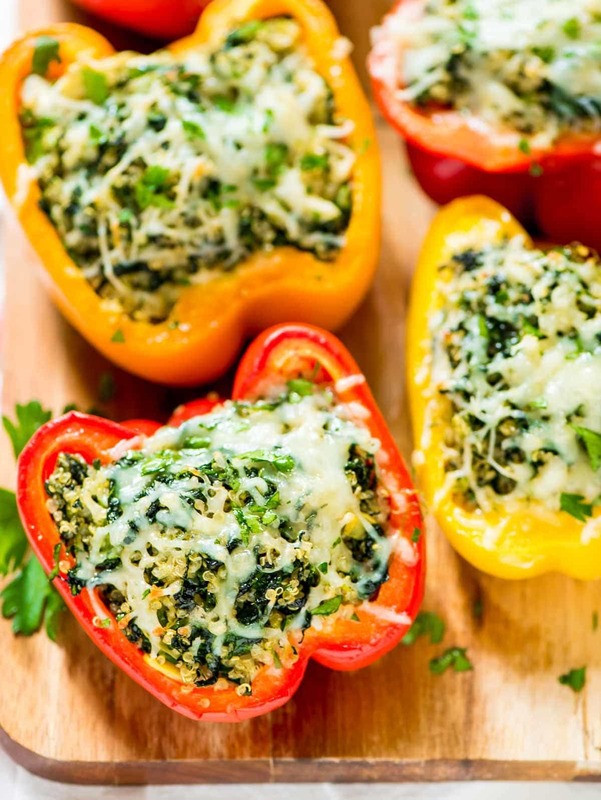 As written, these Spinach Artichoke Quinoa Stuffed Bell Peppers are vegetarian, but you can feel free to add sautéed ground chicken or turkey to the recipe if you like. The leftovers reheat well, so feel free to pack them for lunch, or double the recipe for an easy meal that lasts all week. Um, can I please request a slot on your calendar app?! i made these last night–they were delicious! I love Spinach and Artichoke Dip, this looks like a great recipe to try. Tasty!!! These were delicious! I love the balance you have on your blog and the way you create food that is healthy without feeling depriving! I’ve never commented before, but I just wanted to let you know that I love your creations and your approach to cooking/baking/all things delicious ?? Emma, this comment made my day!! Balance is exactly what I am going for, so this means more than I can say. I’m so glad you enjoyed the recipe too. THANK YOU! I just wanted to let you know that I made these tonight and they were the bomb.com! I cannot wait for lunch tomorrow. Thanks for continually making healthy and tasty dishes! Maggie, I am SO EXCITED to hear this. The bomb.com is a serious compliment in my book. Thank you! AMAZING!!! These will go in my regular rotation for sure! I used whole wheat pearl couscous instead of quinoa because it is what I had and I wanted to keep things budget friendly. Still delicious! Thanks for the great recipe! Thank YOU we’re leaving this glowing review Annie! I’m so happy to hear that you loved it so much, and the couscous sounds delicious. I loved these! One suggestion I’d have is to boil the peppers for 5 minutes before stuffing/cooking them. I realize it’s a personal preference, but I like them a little softer. The flavor was great, I’d definitely make these again. Thanks for the recipe! Great suggestion, Carol! Thanks for chiming in! Your recipe is so yummy. I stuffed a couple portabello mushrooms with it also. Amazing. Thank you. Hi April! Thank you so much. I’m glad you enjoyed the recipe, and using mushrooms sounds like a great idea! I really appreciate your taking the time to leave this great review! Delicious. I added ground turkey. That’s a great addition, Chris! I’m so glad you enjoyed the recipe. Thanks for sharing your tweak and this wonderful review! Thank you so much, Janet! I’m so glad to hear you enjoyed the recipe. Definitely Barb! Just let them thaw overnight in the refrigerator then reheat gently in the microwave. I’m so happy you enjoyed it! Thanks for sharing your swaps too! YUMMY! Notes for next time is to increase the basil to 3/4 t and pepper to 1/2 t and try Havarti Dill cheese to another dimension. Sheri, I’m glad to hear you enjoyed these! Thanks for sharing your tweaks for next time too!